On Monday 15 May 2017 we hosted a screening of short documentaries at the Bertha DocHouse in Curzon Bloomsbury. The Fresh Eyes on the World line-up included three short films directed and filmed by our Production Fund grantees. The screening was followed by networking drinks and a Q&A with the featured filmmakers, who discussed a variety of topics including access while filming and the experience of making their first documentary. London-based Thomson Reuters Foundation. She has covered world’s under-reported stories in the forms of short documentaries, photographs and text. Shanshan has previously covered stories including the consequences of China’s family planning rules, the European refugee crises, LGBT in Asia and women’s rights and empowerment. She has been commissioned by TIME Magazine, and her films are on The Atlantic (USA), Aeon Magazine (USA) and Internazionale (Italy) and has been broadcast by BBC and LA independent TV KCETLink. Yi Wu, a city close to the east coast of China, encourages migrants to come to the city to boost its economy. Some 70% of its population are migrants – most are Chinese, but many are from war-ravaged countries such as Yemen, Iraq and Syria. 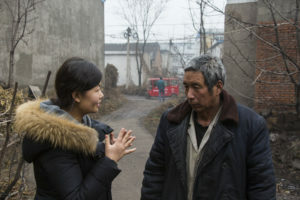 This film tells the stories of three middle-eastern refugees, their challenges and ambitions as they start ‘Living the Chinese Dream’. ZITA CAMPBELL graduated from Otago University, New Zealand in 2015 with a double major in Theatre, Film and Media. She received scholarships and completed the last year of her Bachelor’s degree abroad at the University of California Santa Cruz. After finishing her degree she moved to London and worked freelance within both areas of her studies. She is interested in international media and investigative journalism. The highlight of her freelance work was a Communications Internship with the Global Investigative Journalism Conference in Norway, in which she co-wrote a story that was picked up by IJNET and translated into Spanish, Portuguese, Chinese, and Arabic. This film tells the story of a closeted transgender from Udaipur, who “longs to meet a prince”. Forced into an arranged marriage with three kids, Radheshyaam has been repressed into the role of husband and provider, yet, through dance has found a safe way to explore femininity. Male Rickshaw driver by day, female dancer by night; Radheshyaam ’s life is compartmentalised. This film explores the struggles to be true to oneself. LISA LIN is a document ary producer and photographer with a focus on social issues and injustice in developing countries. Before working on documentary series for Nat Geo Asia in Singapore in 2015, she produced her first documentary film in 2013 on social consequences of then One-Child-Policy in China. Originally from China, Lisa has studied and worked in the UK, China and Singapore documenting daily encounters of her life through the camera. She is particularly concerned with how media could raise the public awareness of unreported issues, further help change the lives of individuals involved and potentially create significant impacts on the society. These films were made with support from our Production Fund, which reopens in September. Find out more information on how to apply. Newer Post One World Media Awards 2017 Older Post Announcing The 2017 One World Media Awards Nominees!